ATLANTA (AP) -Alex Ovechkin is scoring goals and having fun. With a playoff spot on the line, he gave the Washington Capitals exactly what they needed. Ovechkin became the NHL's first 60-goal scorer in 12 years by getting two Friday night in the Capitals' comeback 5-3 victory over the Atlanta Thrashers. "It's always fun to score goals, especially when it's an important game," said the 22-year-old star in his third NHL season. Asked how many more he's capable of scoring, the youngster from Moscow shrugged. No one in the NHL had hit the 60-goal mark since the 1995-96 season when Pittsburgh's Mario Lemieux and Jaromir Jagr both did it. Ovechkin's previous best was 52 goals, accomplished in his rookie season of 2005-06. Nicklas Backstrom scored two goals 32 seconds apart in the closing minutes to give the Capitals a 4-3 lead. Backstrom pushed Washington in front with 3:28 remaining, and Boyd Gordon sealed the important victory with an empty-netter. "It was a huge third period for us," Backstrom said. "We talked about going to the net before the third period. Every point is very important right now." Ovechkin assisted on Washington's final two goals, giving him a four-point night and increasing his league-leading point total to 106. "I like playing in this building," said Ovechkin, who has 14 goals and 11 assists in 12 games in Atlanta. "We started working in the third period. We started to play well. They didn't have a chance to score." 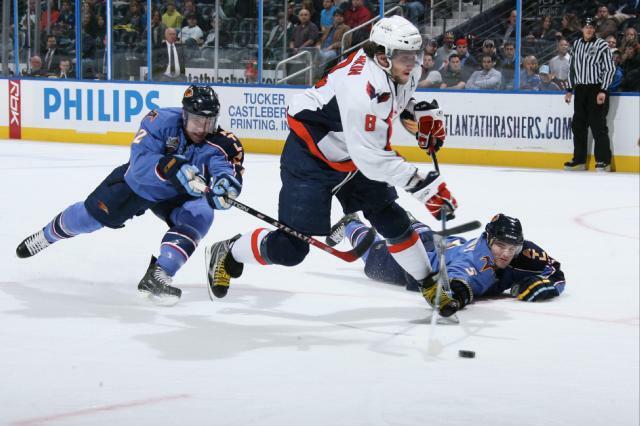 The Capitals won their fifth in six games, while the Thrashers lost their fifth in a row and 13th in 15. Atlanta, the Southeast Division champion last season for the first time, was eliminated from any playoff contention. "We've had a hard time, pretty much the whole year, putting together a 60-minute game," Atlanta captain Bobby Holik said. "At least that's one thing we're consistent with." Ovechkin's 60th goal also tied the Capitals' club mark set by Dennis Maruk in the 1981-82 season. After Backstrom put the Capitals ahead, scoring from in-close, Lehtonen tossed his stick into the air in frustration. The Thrashers carried a 3-1 lead into the third period on the strength of Jim Slater's first two-goal game in the NHL. Washington, which had won four in a row before losing 5-0 to Chicago on Wednesday night, took a 1-0 lead when Ovechkin scored with 4:42 remaining in the first period. The Thrashers scored all three goals in the second. "They don't quit and they showed that in the third period," Slater said. "I don't know what we were doing, but it wasn't good, obviously. It's tough giving up four goals in the third like that to lose a game. They were a hungrier team in the third, and it showed." Rookie defenseman Tobias Enstrom scored his fifth of the season during a power play to make it 1-1 at 4:11. Slater gave Atlanta the lead with a short-handed goal at 7:57, taking a pass from Eric Perrin and skating in on a breakaway against Cristobal Huet. The third-year center, who plays mainly on a checking line and serves as a penalty-killer, has 21 career goals in 209 NHL games. He scored his second of the game at 16:06, knocking a shot from the left side past Huet as he was falling down. Notes: Ovechkin has 23 third-period goals, tops in the league. Atlanta's Ilya Kovalchuk, the only other 50-goal scorer in the NHL season, has 22. ... Enstrom leads rookie defenseman with 38 points (5 goals, 33 assists).